Prime-Line Screen Retainer Spline, Hollow Core, Round, Serrated, Suitable For Use With: To Hold Screen Material to Window and Screen Door Frames, 0.13 Diameter X 25 ft Length, Vinyl, Black Round, hollow core and serrated, used to hold screen material in window and screen doorframes. Use for aluminum and fiberglass screening. Round, hollow core and serrated, used to hold screen material in window and screen doorframes. Use for aluminum and fiberglass screening. Includes: 2 pcs - 1-7/8" Hanger Eye, 1-7/8" x 3/4" Hanger Eye, 2 pcs Hanger, (1) 1-1/2" Hook & Eye, and one Screw. 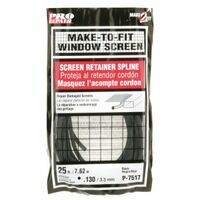 Use with appropriate screen frame to form a finished window screen. Allows frame to be square cut for easy construction by homeowner. Combination tool with wood handle, steel convex and concave rollers used to install most screening materials and vinyl spline into window screen frame. Round, hollow core and serrated, used to hold screen material in window and screen doorframes. Use for aluminum and fiberglass screening. Round, hollow core and serrated, used to hold screen material in window and screen doorframes. Use for aluminum and fiberglass screening. 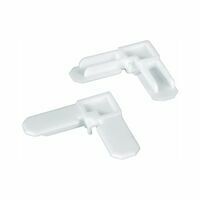 Designed to keep storm windows, screens and other panels in place. Makes window easy to remove. Tempered spring steel for long life. Spring steel base, cold rolled steel center piece. Visual-pack. Installed in spline channel to aid in removal of window screen from window frame. 15/16"W to 5/8"W x 1-1/16"H x 1/4"D, with 3/32" lip. Use with appropriate screen frame to form a finished window screen. Allows frame to be square cut for easy construction by homeowner. Installed in spline channel to aid in removal of window screen from window frame. 15/16"W to 5/8"W x 1-1/16"H x 1/4"D, with 3/32" lip. Prime-Line Screen Retainer Spline, Hollow Core, Round, Serrated, Suitable For Use With: To Hold Screen Material to Window and Screen Door Frames, 7/32 in Diameter X 25 ft Length, Vinyl, Black Wood handle with metal convex and concave rollers for screen spline and drop-in glazing. Used to replace broken screens in windows and doors, or to replace broken glass in windows and doors with aluminum frames. Instructions printed on each package. 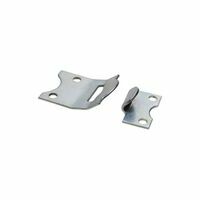 National Hardware Storm Panel Clip, Series: V1369, 1.12 in Length x 1/2 in Width, Aluminum Tube/Steel Screw, For Securing Windows and Screens to Storm Doors Use to attach screens and storm windows to window opening. Includes No.8 x 3/4" Phillips pan-head sheet metal screw. Depth 1/16". Use with appropriate screen frame to form a finished window screen. Allows frame to be square cut for easy construction by homeowner.